RICOH IMAGING COMPANY, LTD. is pleased to announce the launch of the HD PENTAX DA645 28-45mmF4.5ED AW SR. This ultra-wide-angle zoom lens is the latest addition to the PENTAX 645 interchangeable lens series, designed for exclusive use with PENTAX medium-format digital SLR cameras. Providing focal lengths from 22mm to 35.5mm in the 35mm format, this is exclusively designed for digital imaging. 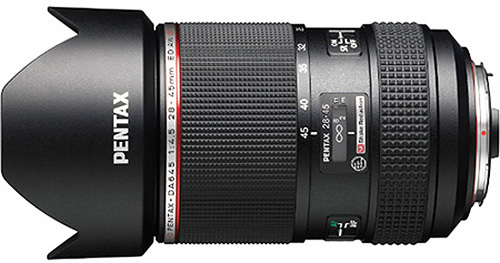 Its image circle is optimized for an image sensor of the new PENTAX 645Z medium-format digital SLR camera (launched on June 27), and a number of PENTAX-developed technologies including advanced lens coatings are incorporated, to deliver super-high-resolution images made possible only by medium-format digital SLR cameras. Thanks to its dustproof, weather-resistant construction, this lens also offers outstanding reliability and durability even under demanding shooting conditions, allowing the photographer to capture various outdoor images, such as sweeping landscapes, without worries.